Michael: How are you going to get up in time to go to school in the morning? You do go to school, don't you? Nando: The hours do not please me. Nando: Three, four in the afternoon, maybe, after siesta. But eight o'clock in the morning? Crazy. Michael: What does your aunt think about that? Nando: I don't know. She not up at eight o'clock either. When casting a romance, it was always a reliable thing to cast some big names in the leads, regardless of how appropriate they may have been on the screen together. Such is the case with this romantic comedy set against an Italian background, as a visibly ill and aged Clark Gable is paired off with a distinctly healthy Sophia Loren. But the two are good enough, and the supporting cast engaging enough, that quite a few flaws can be overlooked. American lawyer Michael Hamilton (Gable) is summoned to Italy to set straight the affairs of his brother, killed in an accident. What surprises Hamilton is that his married brother had gotten involved with an Italian woman, also killed in the accident, and that the two of them left a young boy, Nando (Marietto). Watching over young Nando is the curvaceous nightclub singer Lucia Curcio (of course, Loren). Her laissez-faire approach to childrearing appals Hamilton, and he attempts to get custody of the boy and bring him back to America. Sparks fly from the conflict and also from the romance, stoked in part by the efforts of Hamilton's Italian lawyer, Mario Vitale (neorealist director Vittorio De Sica). This was Gable's penultimate film, and the last to be released during his lifetime. Although he looks fine in some sequences, in others he looks exactly like a man who's about to drop dead of heart failure. Jowly, pasty and with a dazed appearance, he's a shadow of his former self, and often a shadow of himself in other scenes in this very film. Nonetheless, he gamely forges ahead and puts in a reasonably good performance under the circumstances and the 35 years he has on Loren. She's quite a delight (though her singing voice is very crudely dubbed) and plays the Italian vixen to the hilt. The boy's line delivery is rather halting and unconvincing, though the language barrier can account for some of that. The most entertaining performance, however, comes from De Sica, who is quite delightful in every scene he steals. Giovanni Filidoro is also entertaining as his obsequious clerk. 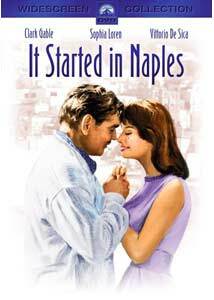 True to the title, the film starts in Naples but almost all of the action takes place on the Isle of Capri. There's a huge production value to shooting such a film on location, and veteran director Melville Shavelson makes the most of it. The picture is fairly dripping with local color and it certainly sets the scene quite nicely. One gets the definite sense of Italian culture, albeit through a Hollywood filter. While there's plenty of cliché on display, it's all quite affectionately presented. The main theme of cultural clash between America and laid-back Italy is quite well-presented, especially through the raunchy earthiness of Sophia in contrast to Gable's button-down attorney. It's rather predictable, but it works well enough on its own terms. While no one will ever confuse this fairly lightweight film with the similar but more bittersweet Summertime of David Lean, it's an entertaining enough little confection. Think of it as a romantic bit of tiramisu and keep expectations low and there's much to enjoy here. Image Transfer Review: The anamorphic widescreen picture is quite lovely for its age. There's beautiful and vivid color throughout, and sharp detail. Edge enhancement and ringing are minimal and only an issue in the highest contrast moments. Audio Transfer Review: The 2.0 English mono audio sounds fine, with only nominal hiss that seldom intrudes unless you're looking for it. The music sounds fine considering the period, with little bass information since there was probably little there in the first place. It's quite serviceable. Extras Review: There are no extras whatsoever. Chaptering is adequate. A lightweight romance with gorgeous settings and a terrific supporting performance from De Sica. Gable is miscast and far too ill, but he does his best.